Hideo Kojima isn't known for his subtlety, so when a mysterious image appeared in his Twitter feed yesterday, many assumed it was a confirmation that a Zone of the Enders sequel is headed for Nintendo's handheld. 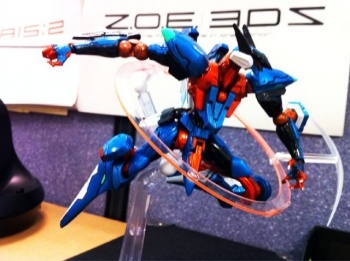 The aforementioned image, which you can see at right, features a figurine of the Jehuty Orbital Frame, the robot piloted by the protagonists of the Zone of the Enders games. Behind that pretty bauble however, is a piece of paper emblazoned with a stylized logo that reads "ZOE 3DS." Kojima's accompanying tweet only serves to further the mystery. "Found this at Omori-kun's desk. What's this?" the designer wrote. The last Zone of the Enders title was 2003's Zone of the Enders: The 2nd Runner. Though Kojima has spent the intervening years focusing almost entirely on the beloved Metal Gear Solid series, he has repeatedly also stated an interest in creating another Zone of the Enders sequel at some nebulous point in the future. Given that said sequel would technically be Zone of the Enders 3 and that there is already a 3 right in the name of Nintendo's handheld, one could argue for the game's existence based purely on the potential punniness of the title. Any gamer present for the early days of the Nintendo DS is already well aware of Nintendo's fondness for punny titles, so while this seems a tenuous connection, you can't deny the possibility. That said, we probably won't know anything until Kojima and/or Konami decides to make this thing official. Or, alternately, until Kojima reveals that this entire thing has been a massive troll spawned from boredom and a longing to screw with gaming journalists. Little does Hideo realize that we get paid either way, and writing about mysterious photographs is way easier than covering actual news. Keep 'em coming Mr. Kojima. You've always got a spotlight here at The Escapist.